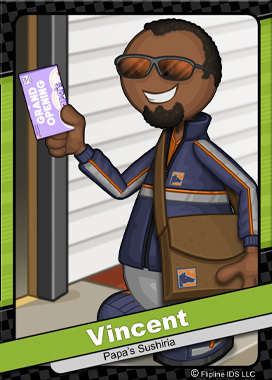 Vincent is a hardworking mailman from the town of Frostfield. While most postal workers stay within their route, Vincent will travel wherever the mail will take him. He’s been known to deliver letters and coupons from the cul-de-sacs of Burgerburgh all the way to the beach bungalows of Calypso Island. Vincent is a natural at small talk, and remembers everyone’s name that he delivers to. When he makes a delivery to Prune Creek Retirement Home, Vincent likes to stay for lunch and chat it up with the seniors.